I got this blazer for my birthday and love it! so pretty. I thought it went perfect with my Stella & Dot Juniper Statement Necklace. Love how you blazer matches your necklace. So pretty. 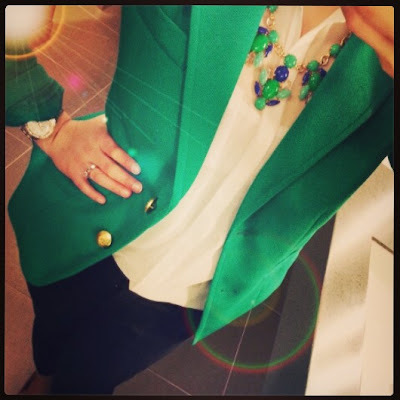 Green is fabulous on you, love that blazer! Lucky girl:)))!!!!! What a gorgeous birthday gift! I want that blazer! I love the structure, style, fit, color....and the gold buttons just throw me over the edge lol! LOVE THIS LOOK:))!